The stylish Casio SE-C450 is designed to meet the needs of almost any retailer. The SE Series of registers are equipped with low noise thermal printers suitable for use in quiet Retail environments. Use an SD Card to back-up your data stored in the register. Data can then be viewed in CSV format on a PC, and journal output is possible. (SD Card not included). Roll replacement is as easy as dropping in a new roll. The operator can quickly and easily change rolls maximising efficiency. The displays are designed to maximise viewability and ease of use. Ten-line display capability facilitates input and confirmation during checkout and register set-up operations. The displays feature a tilt mechanism that permits angle adjustment and is backlit for accurate operation even in dark interiors. Character display and pop-up capability ensure easy readability for customers. The effective use of curved lines produces a sleek, stylish design. 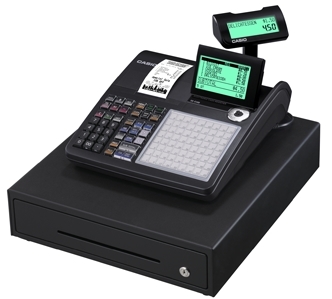 These attractive cash registers fit in perfectly in modern environments like Bars and Bistro's. 4 Note & 8 Coin Compartments. 10 Line LCD Operator Display. 2 Line LCD Rear Display. Height: 213mm Depth: 450mm Width: 400mm (Including Large Drawer). 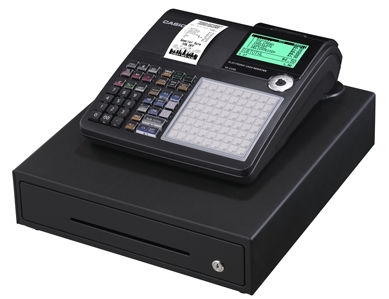 Click the button below to add the Casio SE-C450 Electronic Cash Register to your wish list.